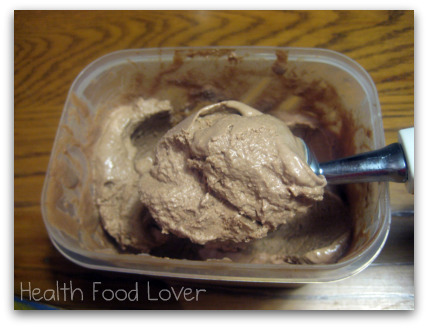 This isÂ really nice creamy chocolateÂ ice cream! It’s a far healthier ice cream than store bought andÂ it’s one that doesn’t use dairy or eggsÂ but instead uses avocado to produce a creamy frozen treat. It would be great for those who can’t have, don’t like or are allergic toÂ dairy or eggsÂ (or even for someone who wants a nutritious treat! )Â ItÂ contains cacao and has a slighty nutty flavour from the walnuts. I made this without an ice cream maker, however if you have one you can use it. Place avocado, avocado oil, vanilla, cacao powder and sugar/syrupÂ in a blender or food processor and blend until very smooth. Add walnuts and water-Â you want a thickÂ mixture so adjustÂ these two ingredientsÂ accordingly. The mixture might warm up a bit in the blender if so leave to cool on the counter. When cool, pour into your container to freeze. A good option for a container is a pie dish that you can cling wrapÂ (preferably earthenware type-dish- if it’s metal or a nonstick you don’t want that to getÂ that scrapedÂ your icecream- or even just a plastic container with a air-tight lid. 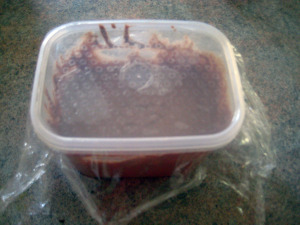 Cover the container tightly with a piece of cling-wrap before putting the lid on. (Use two pieces if using a dish and secure with tape). This helps to prevent unwanted flavours lurking in the freezer to develop in your ice cream. After the first 45 minutes or so, take the ice cream out and either mix with a stick blender or a fork to help break up the ice crystals. Make sure you scrap the sides and bottom of the container as those areas crystalize there the most. For the first 3-4 hours keep breaking up the ice crystals every hour or so until the ice cream becomes a smooth texture. Freeze until it reaches the desired consistency. Once thick, smooth and frozen you can serve! 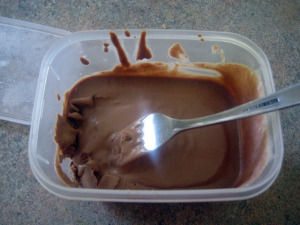 Scoop out with an iceÂ cream scoup or a deep rounded spoon. I put the sugar as optional, but it is needed to help lower the temperature of the ice cream in the freezing process and alsoÂ add a nice sweetness- you can add more or less than the amount I used if you wish. Cacao nibs would give it a nice chocolately crunch. You can use rice, almond or soy milk instead of water. Frozen raspberries would be nice mixed in as its freezing. You could try substituting macadamias, cashews or almondsÂ instead of walnuts. Soak the walnuts for a few hours before hand and blanch and skin the almonds (you can skin them by pulling on one end of the almond- blend the almonds when cool). You could use macadamia oil instead of avocado oil or maybe even like to use coconut oil. If you choose to use coconut oil you may like to add a few tablespoons of coconut flakes or desicated coconut for a more tropical tasting ice cream. 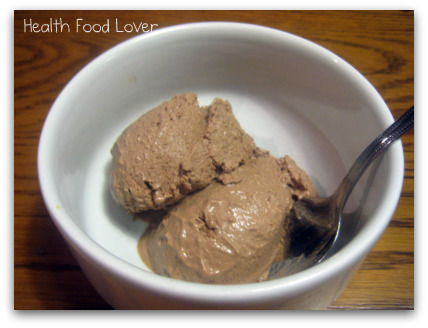 Instead of using cacao powder and avocado oil you can use the combined amountÂ of coconut-cacao butter, if you have it. On Food and Cooking: The Science and Lore of the Kitchen (a very useful food-chemistry book by Harold McGee). I submitted this post to Food Renegade‘s Fight Back Friday November the 2oth. Please check back there for more food loving posts!! How long will this last? Well if not eaten, then in the freezer it can last, or rather stay fresh, for about 2-4 months. That sounds great! Let me know how it goes! Never thought about mixing avocado and chocolate in one ice-cream. Wonderful idea and much more healthy,thanks. It is quite a yummy recipe, thanks! And it is vegan/vegetarian friendly! Thats okay- I love your blog! I’ll surely visit your blog again! Yeah join twitter!